I am still very upset about what happened Monday 19th when I came to your little tranquil village to see how it was after an absence of 3 years visiting there. On a previous visit I saw the crocodiles and was shocked at how close they lived to the village. But that shock turned to horror this visit. I would like to tell what happened as a warning to anyone who has been there or anywhere that crocodiles live and are in contact with humans. As I strolled about the village a lovely large white/ beige short haired dog came up to me, obviously very friendly. As I walked up the beach he seemed to want to follow along and his quiet friendly company was appreciated. After strolling around the beach , decided to go check out the croc population and see if it had changed. I was very surprised to see how many more there were and their sizes. It was very impressive and I was in awe that the local people seem to have accepted these animals in their village. There is a nature trail suggested so thought since I had several hours before the bus was returning to take me back to my hotel in Barra, I would explore. The dog was still with me and as we rounded the bend to start on a trail I noticed that the bridge previously there was broken in the middle, unable to pass. So I came off the bridge and noticing a lagoon at the end of the river and a big croc swimming in there.... not more than 20 feet away from me....... just a few feet from beach umbrellas and the ocean shore. As I stood there puzzling about this the dog went down to the edge of the lagoon to drink, about 6 feet from where I was standing. I saw the croc start to swim towards the shore and glanced at the dog who was still drinking. It flashed in my mind that the croc was coming towards us and I called to the dog to come to me but before I could get him to move the croc had covered the distance of 20 feet and lunged and grabbed the dog by the neck and drug it back in. The whole thing happened in about 15 seconds. I was shocked and sickened that this happened. The speed of that croc was unbelievable. I had heard that they were fast but never imagined how fast. I am sick at heart because of what happened to that poor dog. I understand that it is the way of nature and the croc was only doing what is natural for him. But I must tell anyone who is in areas were crocs are to be extremely careful. From this witness I can tell you crocodiles can move with lightning speed and he knows exactly what to do. The poor dog did not have a chance and I shutter to think if I could have been a victim myself. I am certain that small children would be in great danger there. 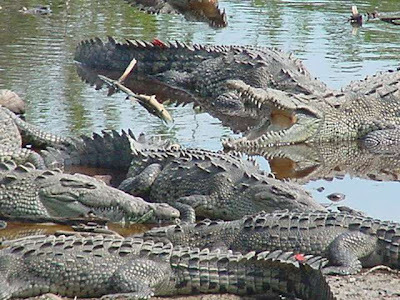 These crocodiles are fast and deadly. Please everyone BE CAREFUL.